As families across the country trim their budgets during these lean economic times, President Obama is also challenging the federal government to do the same through the SAVE Award – Securing Americans’ Value and Efficiency. The SAVE Award demonstrates that it’s not the responsibility of just one person or one agency to watch over taxpayer dollars – it’s an effort shared by each federal employee. At NASA, we place a high value on operating efficiently and effectively so it’s no surprise that one of our employees’ initiatives has earned a spot in the 2011 SAVE Awards “Final Four” and now the American public has the opportunity to decide which one will be presented to President Obama. Matthew Ritsko, a financial manager at Goddard Space Flight Center, has proposed creating a centralized tool crypt that will allow projects to “check out” tools for constructing instruments and spacecraft. New tools are purchased for projects and experiments constantly at NASA; since projects have a finite time-span, once the project ends, the tool is no longer needed until a future program requires it. Without a tracking system, the tool may not get utilized. Ritsko’s proposal is to create a centralized area where tools can be checked in and out at the Goddard Space Flight Center. This proposal is estimated to save NASA and taxpayers $1 million. 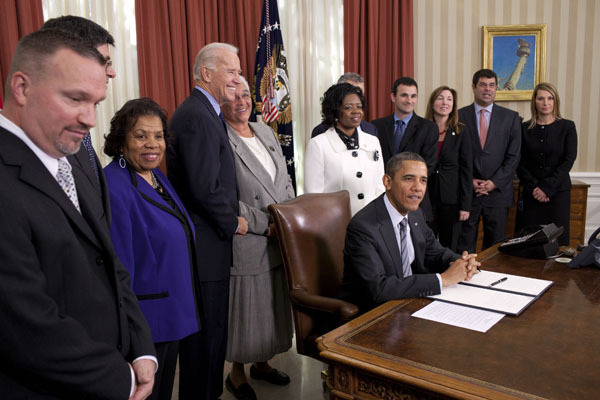 I also joined President Obama today for the signing of an Executive Order that will cut waste and promote more efficient spending across the federal government. Overall spending in the areas covered by the Executive Order will be reduced by 20 percent, saving billions. Congratulations to Matthew Ritsko for his innovative idea and for representing NASA!